Michigan native Michael Porter was born in 1947, was educated at Princeton, and earned an MBA (1971) and Ph.D. (1973) from Harvard. He was promoted to full professor at Harvard at age 34 and is currently C. Roland Christensen Professor of Business Administration at the Harvard Business School. He has published numerous books and articles, the first Interbrand Choice, Strategy and Bilateral Market Power, appearing in 1976. His best known and most widely used and referenced books are Competitive Strategy (1980) and Competitive Advantage (1985). Competitive Strategy revolutionized contemporary approaches to business strategy through application of the five-forces model. In Competitive Advantage, Porter further developed his strategy concepts to include the creation of a sustainable advantage. His other model, the value chain model, centers on product added value. Porter's work is widely read by business strategists around the world as well as business students. Any MBA student recognizes his name as one of the icons of business literature. The Strategic Management Society named Porter the most important living strategist in 1998, and Kevin Coyne of the consulting firm McKinsey and Co. called Porter "the single most important strategist working today, and maybe of all time." The five-forces model was developed in Porter's 1980 book, Competitive Strategy: Techniques for Analyzing Industries and Competitors. To Porter, the classic means of developing a strategy—a formula for competition, goals, and policies to achieve those goals—was antiquated and in need of revision. Porter was searching for a solution between the two schools of prevailing thought-the Harvard Business School's urging firms to adjust to a unique set of changing circumstances and that of the Boston Consulting Group, based on the experience curve, whereby the more a company knows about the existing market, the more its strategy can be directed to increase its share of the market. Porter applied microeconomic principles to business strategy and analyzed the strategic requirements of industrial sectors, not just specific companies. 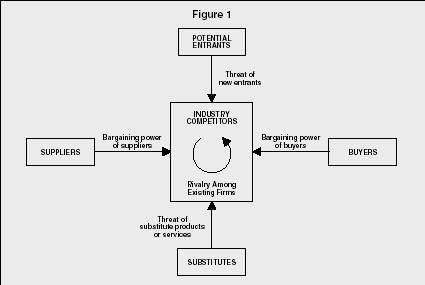 The five forces are competitive factors which determine industry competition and include: suppliers, rivalry within an industry, substitute products, customers or buyers, and new entrants (see Figure 1). Although the strength of each force can vary from industry to industry, the forces, when considered together, determine long-term profitability within the specific industrial sector. The strength of each force is a separate function of the industry structure, which Porter defines as "the underlying economic and technical characteristics of an industry." Collectively, the five forces affect prices, necessary investment for competitiveness, market share, potential profits, profit margins, and industry volume. The key to the success of an industry, and thus the key to the model, is analyzing the changing dynamics and continuous flux between and within the five forces. Porter's model depends on the concept of power within the relationships of the five forces. Rivalries naturally develop between companies competing in the same market. Competitors use means such as advertising, introducing new products, more attractive customer service and warranties, and price competition to enhance their standing and market share in a specific industry. To Porter, the intensity of this rivalry is the result of factors like equally balanced companies, slow growth within an industry, high fixed costs, lack of product differentiation, overcapacity and price-cutting, diverse competitors, high-stakes investment, and the high risk of industry exit. There are also market entry barriers. Substitute products are the natural result of industry competition, but they place a limit on profitability within the industry. A substitute product involves the search for a product that can do the same function as the product the industry already produces. Porter uses the example of security brokers, who increasingly face substitutes in the form of real estate, money-market funds, and insurance. Substitute products take on added importance as their availability increases. Suppliers have a great deal of influence over an industry as they affect price increases and product quality. A supplier group exerts even more power over an industry if it is dominated by a few companies, there are no substitute products, the industry is not an important consumer for the suppliers, their product is essential to the industry, the supplier differs costs, and forward integration potential of the supplier group exists. Labor supply can also influence the position of the suppliers. These factors are generally out of the control of the industry or company but strategy can alter the power of suppliers. The buyer's power is significant in that buyers can force prices down, demand higher quality products or services, and, in essence, play competitors against one another, all resulting in potential loss of industry profits. Buyers exercise more power when they are large-volume buyers, the product is a significant aspect of the buyer's costs or purchases, the products are standard within an industry, there are few changing or switching costs, the buyers earn low profits, potential for backward integration of the buyer group exists, the product is not essential to the buyer's product, and the buyer has full disclosure about supply, demand, prices, and costs. The bargaining position of buyers changes with time and a company's (and industry's) competitive strategy. Economies of scale, or decline in unit costs of the product, which force the entrant to enter on a large scale and risk a strong reaction from firms already in the industry, or accepting a disadvantage of costs if entering on a small scale. Product differentiation, or brand identification and customer loyalty. Capital requirements for entry; the investment of large capital, after all, presents a significant risk. Switching costs, or the cost the buyer has to absorb to switch from one supplier to another. Access to distribution channels. New entrants have to establish their distribution in a market with established distribution channels to secure a space for their product. Cost disadvantages independent of scale, whereby established companies already have product technology, access to raw materials, favorable sites, advantages in the form of government subsidies, and experience. New entrants can also expect a barrier in the form of government policy through federal and state regulations and licensing. New firms can expect retaliation from existing companies and also face changing barriers related to technology, strategic planning within the industry, and manpower and expertise problems. The entry deterring price or the existence of a prevailing price structure presents an additional challenge to a firm entering an established industry. In summary, Porter's five-forces models concentrates on five structural industry features that comprise the competitive environment, and hence profitability, of an industry. Applying the model means, to be profitable, the firm has to find and establish itself in an industry so that the company can react to the forces of competition in a favorable manner. For Porter, Competitive Strategy is not a book for academics but a blueprint for practitioners-a tool for managers to analyze competition in an industry in order to anticipate and prepare for changes in the industry, new competitors and market shifts, and to enhance their firm's overall industry standing. Throughout the relevant sections of Competitive Strategy, Porter uses numerous industry examples to illustrate his theory. Since those examples are now over twenty years old, changes in technology and other industrial shifts and trends have made them somewhat obsolete. Although immediate praise for the book and the five-forces model was exhaustive, critiques of Porter have appeared in business literature. Porter's model does not, for example, consider nonmarket changes, such as events in the political arena that impact an industry. Furthermore, Porter's model has come under fire for what critics see as his under-evaluation of government regulation and antitrust violations. Overall, criticisms of the model find their nexus in the lack of consideration by Porter of rapidly changing industry dynamics. In virtually all instances, critics also present alternatives to Porter's model. Yet, in a Fortune interview in early 1999, Porter responded to the challenges, saying he welcomed the "fertile intellectual debate" that stemmed from his work. He admitted he had ignored writing about strategy in recent years but emphasized his desire to reenter the fray discussing his work and addressing questions about the model, its application, and the confusion about what really constitutes strategy. Porter's The Competitive Advantage of Nations (1990) and the more recent On Competition (1998) demonstrate his desire to further stimulate discussion in the business and academic worlds. Competitive Advantage: Creating and Sustaining Superior Performance. New York: Free Press, 1998. Competitive Strategy: Techniques for Analyzing Industries and Competitors. New York: Free Press, 1998. Mahon, J. F., and R.A. McGowan. "Modeling Industry Political Dynamics." Business and Society 37, no. 4 (1998, December): 390–413. Porter, M.E. Michael Porter on Competition. Boston, MA: Harvard Business School Press, 1998. "Professor Porter Ph.D.: Management Theorists." Economist, 333 (1994, October): 75. Siaw, I. and A. Yu. "An Analysis of the Impact of the Internet on Competition in the Banking Industry, Using Porter's Five Forces Model". International Journal of Management 21, no. 4 (2004, December): 514–524. Slater, S. F. and E.M.A. Olson. "Fresh Look at Industry and Market Analysis." Business Horizons 45. no. 1, (2002, January/February): 15–23. Surowiecki, J. "The Return of Michael Porter." Fortune 139, no. 2 (1999, February): 135–138. How i can use this model for insurence business? is indian insurtence industry doing well?